If you are planning a trip to Universal Studios, be sure to take advantage of the new pedestrian bridge that will be built across Kirkman Road. This value-added concept will significantly improve the safety of pedestrians walking from the theme parks to the hotels. Drivers will also experience improved traffic operations at the Kirkman Road interchange because the pedestrian signal will be eliminated. 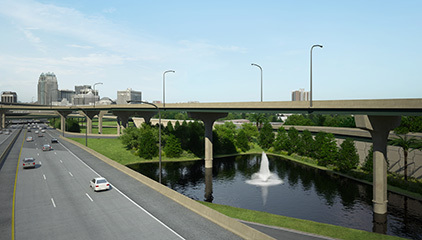 Traffic will flow smoothly in this busy area thanks to the new Grand National Drive overpass, which connects directly to the Express Lanes. The westbound I-4 exit to Orange Blossom Trail is shifting from the left side to the right side to increase safety and promote better traffic flow. In addition, the westbound I-4 exit ramp will be realigned to sweep further away from the mainline before crossing Orange Blossom Trail. This new design reduces noise impacts and lowers the mainline profile. 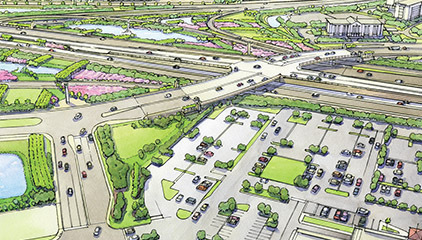 Drivers will recognize a highly increased ease of access at the State Road 408 interchange because of the innovative direct connection from the Express Lanes. Required by FDOT, this design feature also provides a direct connection with improved access at South Street. 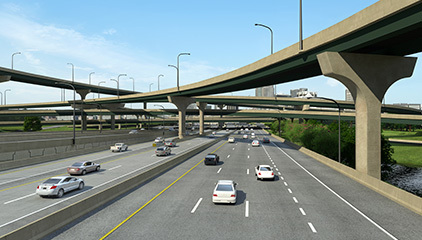 The direct connection does not add another level to the interchange, thereby providing safer construction and maintenance. Many drivers regard Ivanhoe as the gateway to downtown Orlando. 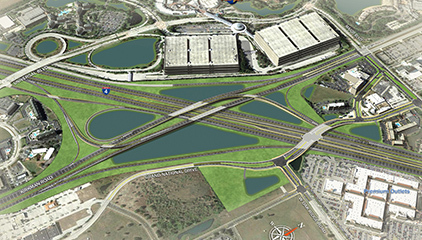 To reinforce such sentiment, entry landscaping, vertical monuments and lighting features will be added to I-4. These elements help create a signature corridor and unify the entire 21-mile project. Drivers also have direct access to the Express Lanes here. Fairbanks curve was a hotspot for traffic incidents. With the realigned roadway, drivers will have improved sight distance and safety. An additional auxiliary lane between Princeton Street and Fairbanks Avenue increases the capacity of the roadway, allowing for better traffic flow. Kennedy Boulevard travels through Historic Eatonville, the first all-black town in the nation to incorporate. To pay homage to this unique town, key landscape and aesthetic features were added along the corridor. Drivers wishing to visit this area should exit at Lee Road or Maitland Boulevard, since Kennedy Boulevard remains an overpass with no ramp connections. The Altamonte area is home to A-FIRST, a cost-saving project that diverts runoff from I-4, stores it, treats it and then sends it to areas where irrigation is needed. If you are headed to the Altamonte Mall or Crane’s Roost Park, you may encounter the new pedestrian tunnel. The tunnel allows pedestrians to safely cross under State Road 436 just east of the Douglas/Wymore intersection. Drivers may notice the same decorative pylons seen throughout the project at Central Parkway. A new feature in this location is a direct access ramp at Central Parkway, allowing drivers to get into the Express Lanes without being on I-4 first. The direct access improves ramp access at State Road 434 and State Road 436, contributing to a smoother traffic flow in the area. As drivers approach the eastern limits of the project, they may notice extra greenery at the State Road 434 interchange. These plants actually serve a great function besides increasing aesthetic appeal. Using native plant life significantly reduces maintenance costs by minimizing the need for irrigation systems. Drivers can directly access the Express Lanes from nearby Central Parkway. As you make your way to the Amway Center from the east, you will enter the Ivanhoe area — a main access point to and from downtown Orlando. The area includes many aesthetic features, including entry landscape, vertical monuments, lighting features and dynamic illuminated pylons that demark the gateway. Drivers will also use additional auxiliary lanes eastbound, from Colonial Drive to Princeton Street, westbound from Maitland Boulevard to Lee Road and eastbound from Princeton Street to Fairbanks Avenue. These new lanes increase the amount of traffic the area can accommodate and improves the level of service. No more traffic jams as you leave that downtown concert! 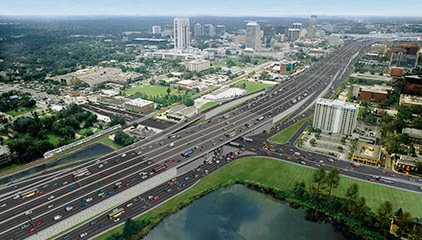 The downtown Orlando stretch of I-4 is home to eight interchanges, including State Road 408. Whether you’re just passing through or headed to one of downtown’s many cultural attractions, you’ll notice a more aesthetically pleasing design and a more open-air feel. 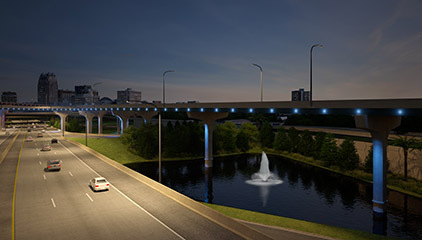 Drivers and pedestrians alike will experience a true transformation as the bridges and the spaces underneath are beautified with green space and lighting accents. 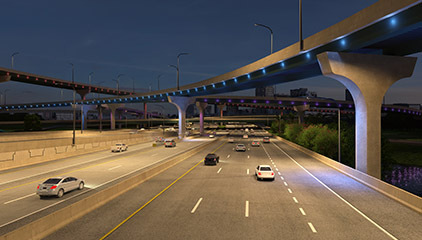 Color changing lights will adorn the underside of I-4, and signify events with different lighting, such as purple lighting when Orlando City Soccer Club plays. Note: These plans are preliminary. Please contact us if you have questions or need details.